Illustrations: The 3d, 6d, 8d, 9d, 1/-, 10/- stamps and PC 20, EN 7, EN 8, EN 9, WR 6, are by courtesy of The Western Australian Museum. The others are from local private collections. – Originally produced for the PSWA Centennial National Stamp Exhibition (2012) Catalogue – images have deteriorated through various reproductions – The webmaster would appreciate finer copies if they are available that may be reproduced with permission. Two factors, the decision by the Commonwealth Government in late 1910 to issue a uniform stamp design, and the introduction of an Australian base letter rate of 1d on 1 May 1911, had a major influence on collecting in 1912. 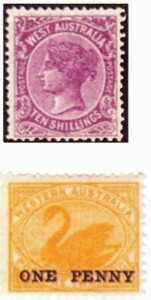 The first generated a significant reduction in stocks of 2d ‘State’ material by surcharging, whilst the second reduced general usage of 2d denominated stamps and postal stationery. 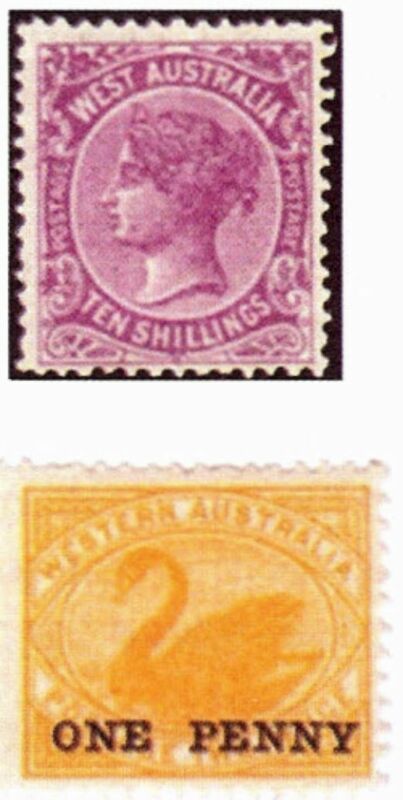 De La Rue despatched their ½d, 3d, 5d, 6d and 1/- surface printing plates to Melbourne on 22 August 1902. Of these, the 3d, 6d and 1/- plates were put to press for the last time in 1912. All plates were destroyed at the Stamp Printing Branch, Commonwealth Treasury, Melbourne, on 2 July 1913. 3d. Orange Brown. The original De La Rue 240-on plate made in 1872 was bisected in Melbourne circa 1906-07. A 120-on plate was put to press in 1912. The last three printings were on the new pre-gummed CrA paper which is noticeably thinner than the earlier CrA paper. Known from 30-11-12. 6d. The CrA paper in general use did not fit the De La Rue plate layout very well so South Australia’s ‘Crown over Single-lined A’ paper was used. The watermark is always Sideways Right indicating that the sheets were bisected before printing. Perforation was by the new 12 x 11½ Double Vertical Comb machine made by James Southcott and intended for Adelaide but delivered to Cooke in Melbourne. Known from 9-04-12. 1/-. Green. The stamp production details are the same as for the 6d. Known from 25-03-12. 1/-. Line perforation 12½. Five examples currently on record. Two of these, including this one, are cancelled by MOO SANDSTONE Type D, 10-06-12 and another is dated either 21 or 24-??-?? A fourth is cancelled MANINGA MARLEY, near Sandstone. The fifth is in the Queen’s Collection. Two strips of three were reported in 1918-1919. 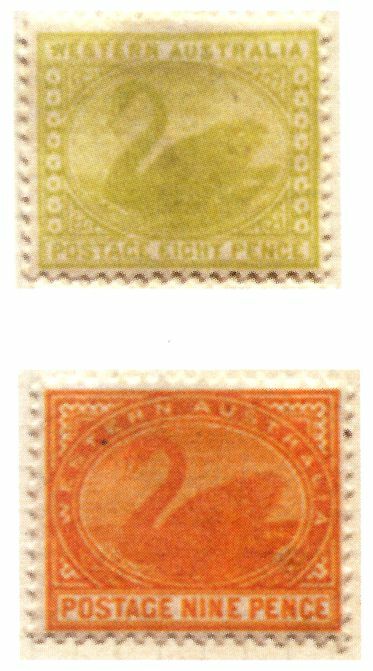 The two stamps dated 10-06-12, appear to be the first (this one) and the third (Walkley Collection), from a vertical strip of three. 8d. Intended for the 1lb interstate parcel rate. The design was derived from the De La Rue ½d postcard die, enlarged to 23.5mm x 19.5mm. The ‘Oliver’ proofs used for the 8d and 9d are illustrated in Hamilton and Pope, (1979, 330). Their present whereabouts are not known. Known from 20-04-12. 9d. Intended for the basic telegram rate. The design was derived from the Melbourne 4d. The shade is that of the 3rd printing but the watermark is upright. Known from ??-07-12. distinctively different shade. Both printings were on VCr paper. This shade was eventually issued from 15-04-12.